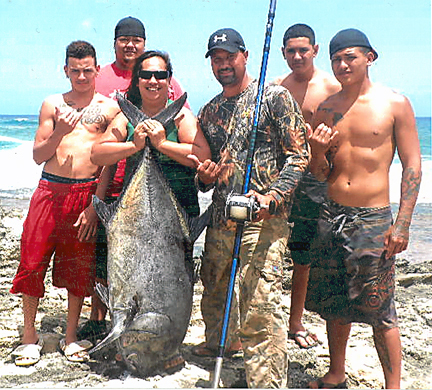 Waiolani Martinez was fishing with her husbnd William and their friends Micah, Ivan, Bryson and Tash when she hooked this monster ulua. Waiolani defeated this beast using a Nitro Sealine 900H reel loaded with 80-lb test Ande line with her husband by her side coaching. End result: a blistered finger and a 101.1-lb ulua in the bag. This is Waiolani's first ulua after fishing by her husband's side for 12 years and the first woman to enter the esteemed HFN 100 Plus Club. Historic!